Helen started life in Pocatello, Idaho, the youngest of three children in a railroad family. The family would often go to the airport and watch the airplanes. It was during those visits that Helen began to dream of flight and the feeling of flying like a bird. After graduating from the University of California at Berkeley, the opportunity came. As World War II was approaching in 1940, the government established the Civilian Pilot Training program to introduce pilots to aviation and possible later military service. Helen snapped up one of the two spaces available for women. But it would take a few years more to discover soaring. She served in the WASP (Women Airforce Service Pilots) for a while until near the end of the war and then joined the SPARS (women's branch of the U.S. Coast Guard). After the war, she moved to San Diego where she took a civilian position with the Coast Guard utilizing her educational background and training. 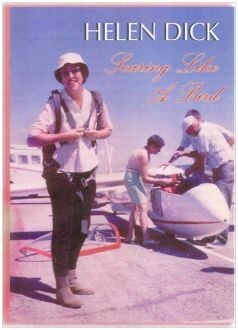 Her flying was limited to rental airplanes but a friend encouraged her to join the Associated Glider Clubs of Southern California and she became a tow pilot. She could not resist the opportunity to resume flying more actively. Her fellow club members told her she had to fly gliders. Being a typical power pilot at the time, she resisted. Eventually she tried flying a glider and her life was forever changed as she discovered the joy of soaring. In the spirit of volunteerism that Helen has exhibited so much during her entire life, she soon found herself involved in activities helping others. Her efforts started with the club and then expanded to the national level. She took on the task of processing soaring badges as a volunteer. She served SSA as an elected director for three years. She helped build a club sailplane and later joined with a partner to build a personal sailplane. Helen chose not to fly in competition but helped as an official in several contests. She was an active member of the Southern California Competition Club (S3C) formed for the purpose of developing competition documentation techniques and encouraging pilots to take part in contests. She owned six sailplanes with partners during her soaring career and also two airplanes. Her main love was soaring for records, a task in which she had great success. Most of her flights were north from the desert of Southern California along the mountains of the Owens Valley. 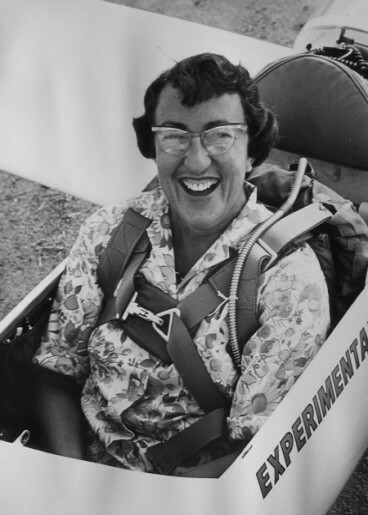 She often continued towards the northeast from Boundary Peak at the north end of the Owens Valley - a route she pioneered that is now being used by many long distance soaring pilots. When she was soaring on a weekend, the radio chatter indicated other sailplane pilots were wondering where she was and trying to follow her. They knew her successes and would try to learn from her cross-country soaring strategies. Helen earned Silver #337 in 1959, Gold #120 in 1962 and was the first American woman to earn a full Diamond - #79 (Intl #545) in 1967. Her contributions to the sport, in the air and on the ground, were recognized by the SSA Exceptional Achievement Award in 1972, the SSA Certificate of Appreciation in 2004 and the most prestigious of all - the Eaton Trophy in 1972. Helen lived the dream of her youth - the freedom of flight, the feeling of flying like a bird - a soaring pilot.